My search for the perfect soup started a couple of weeks ago when I noticed I had some celery and onions I needed to put to use. You know, the celery that’s half frozen in the vegetable bin that you are desperate to use before it goes bad? Yep, that was me a week ago. When I’m looking for soups, I frequent a couple of “go-to” resources, one of which is always 101Cookbooks. I love Heidi Swanson’s take on vegetarian cuisine. I also really love her *favorites* list so be sure to check those out when you can. In fact, she just posted her most recent list yesterday. Ah, it is DESTINY. Anyway- back to the soup. As I searched, I found this recipe: New Year Noodle Soup. 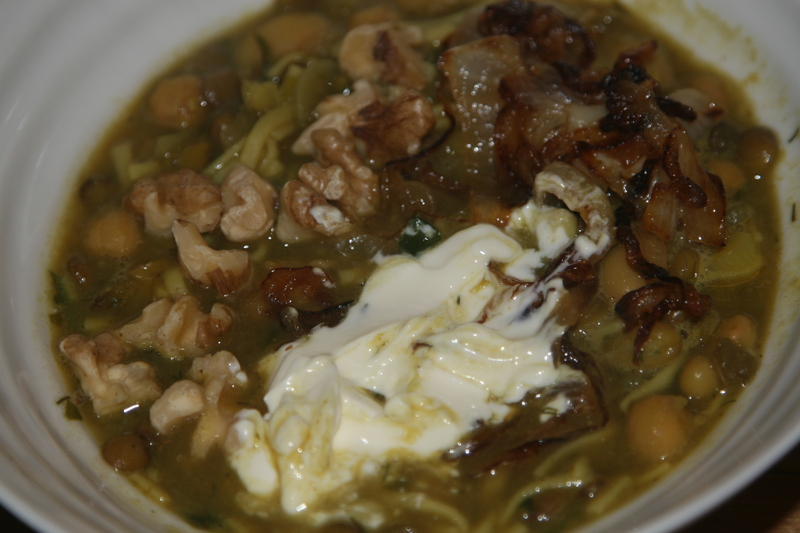 This soup has a lot of my favorites: chickpeas, noodles, cumin, cilantro, sour cream, onions…but, alas…no celery. So, I did what any inspired home cook would do: I abandoned the original celery plan and just made this soup. A few caveats before you get started: This recipe takes a little effort. There are steps. And chopping. And toppings. But I promise it is worth the effort in the end. I followed this recipe almost exactly except I couldn’t find the borlotti beans, so I just doubled the chickpeas and called it a day. Please don’t forget the toppings. I know, I know…by the time you finish the soup you are just ready to dive in. I get it. But the toppings are a necessity. I repeat: Do. Not. Skip. Hope you enjoy it! And…I’ll let y’all know what I decide to do with the celery. Eventually.